In this, the third collection of horror fiction from Simon Kurt Unsworth, you will find tales of words that can corrupt a world, of hotels that are not what they seem, of sculptures made at night from cans and bottles that have a meaning we cannot hope to grasp and of a journey to work that becomes a nightmare. These are monsters here and roads down which impossible vehicles travel, and mines and shadows and children made of twine and stitch. Simon Kurt Unsworth was born in Manchester in 1972 and is beginning to despair of ever finding proof that the world was awash with mysterious signs and portents that night. He lives in an old farmhouse miles from anywhere in the Lake District with his fiancée Rosie and assorted children and dogs, where his neighbours are mostly sheep and his office is an old cheese store in which he writes horror fiction (for which pursuit he was nominated for a 2008 World Fantasy Award for Best Short Story). 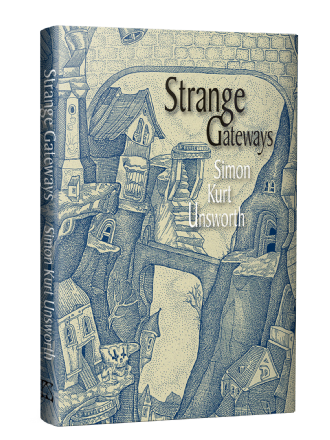 Strange Gateways is his third collection of short stories, following 2011’s critically acclaimed Quiet Houses (from Dark Continents Publishing) and 2010’s equally well received Lost Places (from Ash Tree Press). His stories have been published in a number of anthologies and he has a further collection due, the as-yet-unnamed collection that will launch the Spectral Press Spectral Signature Editions imprint. His novel The Devil’s Detective is due out from Doubleday in the US and Del Ray in the UK in early 2015.